It's finished. I took my sweet old time getting started on it, but one day I got an idea in my head and that was all there was to it ... I had to make a quilt and what better one to make than the one for the giveaway winner. MeganAnne, the winner, said she liked earthy colors ... but would be happy with whatever I made. Famous last words! LOL I'm not exactly sure what earthy colors are, but I guessed not pink, turquoise, or purple so I left those out of the quilt as much as I could. 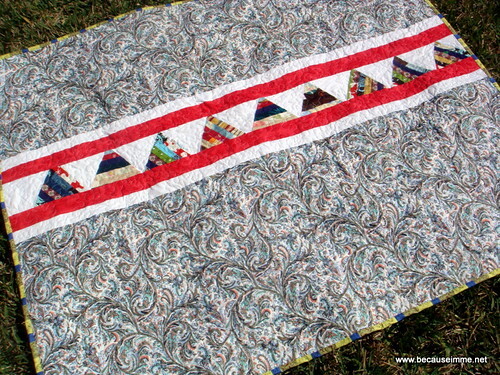 The striped triangles are made from very long 2" wide strips of fabric scraps sewn together into eight rows. 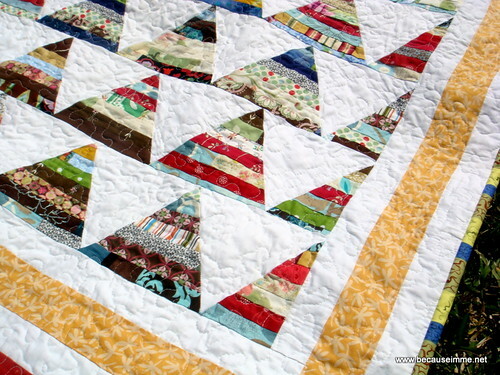 Then I just cut the equilateral triangles. I opted to have the triangles on the far sides be half triangles ... no particular reason, I just thought it'd give it a little more character, kind of a little unexpected something. The white spaces are white Kona cotton. The borders are fairly gender neutral ... not completely but the fabrics don't scream "girl". I made this a little larger than a typical small quilt. It's still small, but hopefully large enough to provide a little coverage while reading a book or watching tv on a cool evening. 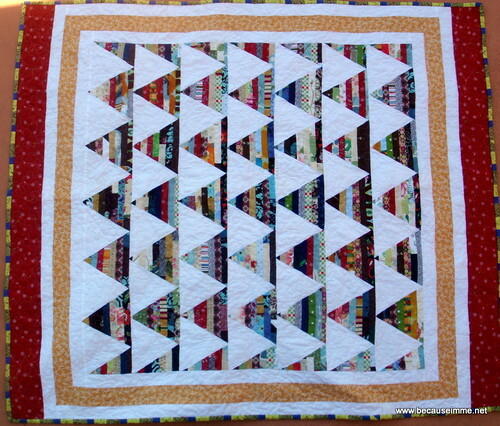 The backside is a funky busy swirly fabric from my stash with a row of triangles going up the middle. Those triangles don't have all the stripes lined up, they are more random. That seemed like it'd be more fun since it's just the one row of triangles. One thing I realized as I was making this quilt is that I love the process of beginning a sewing session as much as I love the sewing. I sew in my bedroom, so the room is pulling double duty. Before I sit down at the machine, begin picking fabrics, or cutting, or whatever I clean the room. The bed gets made, the floor cleaned up and vacuumed, the table surfaces all cleaned and dusted, everything put where it goes (even if I know I'm about to pull it back out). I get my big diet coke, set the tv to HGTV, place the phone nearby ... and then all is right with the world (room) and I'm ready to begin. Ahhh ... Am I the only one who feels this way? I hope not. 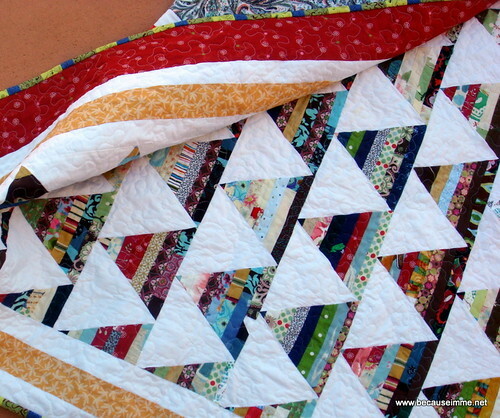 This quilt is full of mistakes. I'm pretty disappointed about that. There is one biggie on the backside, but I wasn't sure how to fix it after I discovered it. MeganAnne, I hope you can overlook that and enjoy it anyway. Wow! Quilt turned out beautiful. It was extremely interesting for me to read that article. Thank you for it. I like such themes and anything connected to this matter. I definitely want to read a bit more soon.